This photo was taken in an abandoned farmhouse in the Koshkonong, WI area. The property still has occupants and I did ask for permission to shoot on their land. The property owners do not wish to share their address and I must honor their wishes. The house itself was in really bad shape. Water damage has caused the first floor to collapse into the basement. I was able to inch my way along the edges into one room that was filled with magazines, newspapers, and books. Most of the texts were illegible in the layer of filth that had accumulated. 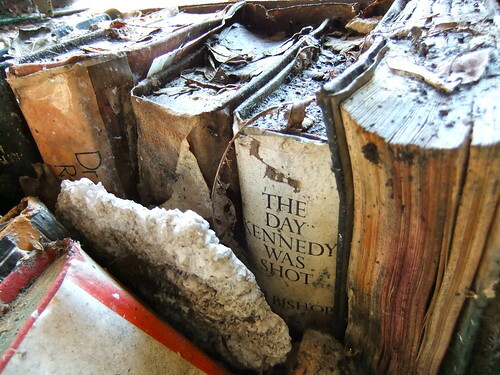 Tucked away on a shelf to the right was the spine of “The Day Kennedy Was Shot” by Jim Bishop. I’m not a big fan of the Fuji F70 EXR that I took it with, but this is one of my personal favorite photos. Sometimes there isn’t much to shoot at an urbex location. Sometimes just one shot is enough to make the entire effort worthwhile.